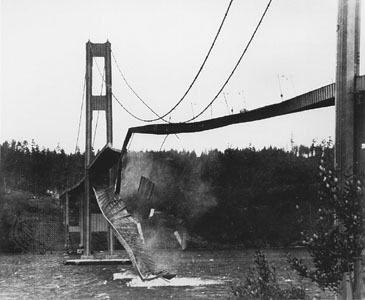 It was an unfortunate morning of 7th November 1940 when winds having speed of 42 miles per hour suddenly twisted the Tacoma Narrows Bridge and lead to its collapse. This accident though didn’t look any lives but it surely made the civil engineers to think new ways to combat bridge collapses. It is located in Tacoma, Washington, USA and was completed in 1940. This was a suspension type of bridge with length of 7,392 feet and was built at the cost of $6.4million.It had the longest span of 2800 feet. The bridge was designed by engineer Moisseiff who had strengthened it with a solid steel girder beneath the roadway.But the problems started soon it was opened to traffic.Under strong winds, it swayed much beyond the permissible limits and thus sent rippling waves along the deck. It took just 4 months before this bridge collapsed after its completion. This bridge also got the name “Galloping Gertie” due to its unusual twisting and rolling behavior. See this video to see how this “Galloping Gertie” used to sway. new way of collapse , which is really give a impact to design engineers to give a alternate solution to wind load. the design engineer should predict that such kind of impact could happen there with bridge…he must check the last hard affectz of natural climate on that area..then by focusing these consideration he desigh the bridge or whatever he wantz to design..preplanning must be considered in the design…while economy iz also an issue…but money iz not more than humen life. It looks that wind effect has not been taken into consideration up to the mark in its design.